The oil major's earnings plunged 56% - not as bad as markets were expecting. In a world of cheap crude, oil majors are holding up pretty well at the moment. Profits are plummeting – but not as much as everyone was expecting. Yesterday, BP announced first quarter profits had fallen a better-than-expected 39%. And today Shell said its earnings on a current cost supplies (CCS) basis (the industry’s preferred measure – BP calls it replacement cost profit), stripping out one-off ‘identified items’, had plunged 56% from $7.3bn (£4.7bn) to $3.2bn in the first three months of 2015. Not a pretty sight, then, but analysts polled by Bloomberg had expected a much deeper fall to $2.5bn. Also like BP, the FTSE 100 giant was propped up by refining and trading profits, which rose from $1.6bn to $2.6bn. But its upstream exploration and production earnings collapsed from $5.7bn to $675m, as oil averaging $54 a barrel for the quarter, having been as high as $110 last June, took its toll. And European oil majors Eni and Total have both said they expect the continent’s refining surge to come to a screeching halt later this year. Hence why all the big players are slashing investment and assets like there’s no tomorrow. In January Shell said it was cutting the former $15bn over the next three years, including axeing a $6.5bn petrochemicals plant in Qatar. Today it said it had sold $2bn of assets so far this year, highlighting the reduction of its onshore presence in Nigeria. It’s a playbook the oil giants are well versed in, but have also been criticised over in the past, for going too far and subsequently not being able to leap on the bandwagon quickly when prices do recover. Whether that will be the cast this time around still remains to be seen – Brent Crude has risen recently to around $65 a barrel, but still isn’t in full-blown recovery mode. 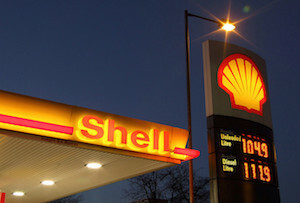 Conspicuously absent from Shell’s statement was detail of its £47bn mega-acquisition of BG. ‘The proposed combination with BG… would create a stronger company for both sets of shareholders,’ chief exec Ben van Beurden said (no, really?). He added it would ‘accelerate Shell's growth strategy in deep water and LNG’ and help ‘optimisation’ of assets in the long-term. Investors weren’t too bothered by the lack of forensics or the falling profits: Shell’s shares rose as much as 2.1%, and were up 1.2% to more than 2,094p in mid-morning trading. For now then, Britain’s biggest oil company has the thumbs up to keep on keeping on.